The Polish larch is a form of the European larch (L. decidua) found on the highlands of central Poland. 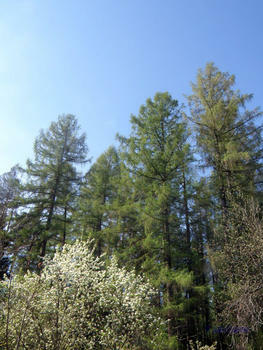 Some botanists consider it an intermediate relict form between the European and the Siberian larches, based on cone shape. The largest larches at Mustila are Polish larch planted in the 1920s at Lepistö crossroads. The tallest specimens were measured at over 35m at the turn of the millennium. With thick twisted trunks and hanging branches they are extremely picturesque, especially in spring when the fresh green leaves appear. The species has not been much grown in Finland although it is fully hardy at least in the south, and possibly further north, too.